When the temperature drops overnight, dogs don’t have the benefit of pulling something out of the closet to wear. While some parts of the country tend to enjoy mild winters, abrupt changes in the weather often leave pets shivering in shock. Ice and frozen water: Thin ice is a real danger to dogs and puppies who might not realize where they're stepping. Prevent drowning and hypothermia by keeping your dog away from these areas. Even if the ice is thick enough, your dog could lose control on the slippery surface and tear a muscle or ligament. Antifreeze: Even a little antifreeze could be fatal to your dog. It's important to keep these containers locked away and clean up any spills immediately. It's also helpful to learn to recognize the symptoms of antifreeze poisoning in pets, such as vomiting, lethargy, and trouble walking. Arthritis: If your dog is already experiencing symptoms of arthritis, it can become more apparent in cold weather. You will want to keep your dog as warm as possible (try heated bedding) and be sure to give your dog any vet-provided medication as instructed. Carbon monoxide: Be extremely careful about leaving your dog in a running car while you shovel snow in the winter. Check your tailpipe to make sure it's not blocked. Beyond those dangers, there are a number of other things you'll want to be aware of when it comes to your dog in cold weather. Dry skin can be an issue, for instance, and sweaters and dog boots can keep your pooch warm. 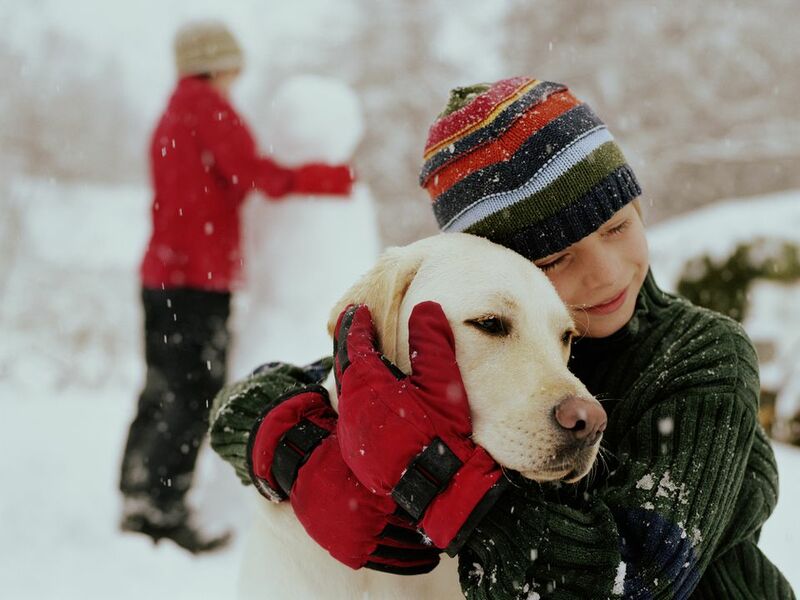 You can also help them stay warm by providing more calories in their diet or stimulate your indoor dog's winter coat. And, it's critical that outdoor pets be provided with adequate shelter from winter's blowing winds. You can gradually acclimate pups to outdoor chills and stimulate their fur to grow thicker and be more protective. Exclusively indoor pets won’t be as well equipped to spend time outside, so be aware and bring them back inside after only short trips to the bathroom and back. Get your pets used to the falling temperatures by offering small tastes of cold weather in two- to three-hour periods beginning in early fall. Once the weather drops to the forties or below, a half hour to an hour of supervised time outside in both the morning and evening can help prompt thicker fur growth. Puppies are less cold tolerant because they have less muscle and fat mass than adults. Muscle and fat increase their metabolism and keeps them warm. Puppy coats also won’t be as thick or long to offer protection. Little pups have less body mass to generate natural heat, too. Young dogs and adults with short fur can benefit from a doggy sweater, especially when they need to do their outdoor bathroom duty. Some dogs may be hesitant to wear a sweater at first, but if you introduce it slowly and as a positive thing, most will take to it rather well. In fact, many even look forward to "getting dressed" after a while. They learn that the sweater is warm and means there's an outdoor adventure in their future! Give your dog a whole outfit with a sweater and a pair of boots! Your dog's feet are exposed to snow, ice, and salt in the winter, all of which could damage the paws or pads. Your dog could even experience frostbite if exposed too long to extremely cold temperatures. Look out for little snow or ice balls that may get caught in-between the toes or in the foot hair. Iced sidewalks and salt can cause chapped paws as well. They should either be avoided with boots or you should be sure to wash your pet's paws after a walk with a warm washcloth. If left unwashed, your dog may lick its dry paws and ingest the salt, which can lead to gastrointestinal irritation. Pets often develop dry skin, dull coats, and static-filled fur during the winter as a result of artificial heat from furnaces. Ask your veterinarian or at the pet store about fatty acid supplements which help counteract the drying effects of winter weather. A humidifier in the home can help your entire family's skin as well. Combing your pup can create even more static. Before grooming, use a wire hanger to “ground” the charge and get rid of the static. Carefully stroke your dog with the long (smooth) bottom edge of the metal hanger from its neck to tail, and on both sides. Avoid the face or other tender areas. Pets stay warm by burning fuel—the food they eat. They need more calories to generate increased body warmth, too, especially if they’re outside pets and can’t rely on your warm lap. Puppy food and “performance” diets offer more calories but you may also need to increase the portions, especially if your pup spends much time outside. If your dog won't eat all the extra food during scheduled meals, increase the number of times it's fed each day. Most will be more than happy to partake in an extra snack. Getting wet, or sitting in the cold wind, allows body heat to be stripped away and predisposes pets to cold risks. When fur stays clean, untangled, and dry, it traps a warm layer of air next to the pet’s skin that helps protect them from the cold. Provide your outdoor pets with a doghouse or other shelter, even during moderate temperatures. That way they have time to get used to sleeping inside and learn to take shelter out of the wind and rain. Avoid accommodations that are too large. Outdoor shelters should be only slightly larger than the curled-up pet. This allows the dog’s own body heat to fill up the space and keep it warm. It’s best to offer a puppy-size shelter rather than a jumbo dog house if your little one hasn’t reached adult size. If you already have an adult-size dog house, simply place a smaller shelter such as a puppy size dog crate inside for your dog to use as a bed. Put a dry blanket or straw bedding inside for the pet to burrow and snuggle. Staying in the garage helps keep the wind off their backs, but dogs still need a small cubbyhole to hide inside. Something as simple as a cardboard box can help as long as it stays dry. Providing a light bulb overhead can offer some warmth. You can also find terrific pet warming beds or safe pet heating elements to situate under the dog’s bed. It's important to be prepared before cold weather strikes. Consider your dog's individual needs and make the appropriate arrangements beforehand so you're not scrambling for a solution during the first winter storm. When an outdoor shelter or garage isn’t available, pets should be inside whenever temperatures drop below 40 degrees or the weather turns nasty. This is also the temperature range when you need to pay attention to your indoor dog's outside time. Try to limit it by going for shorter walks or finding indoor alternatives. Do your best to speed up potty time without rushing them so much that you provoke accidents in the house. If you notice your dog shivering as temperatures drop, it's time to try a sweater. Boots take more time for dogs to accept because they feel very unnatural. The first few times can be quite comical! Try them out in the house for short periods of time and use your training to prevent the dog from chewing on the boots. Not every dog is going to come around, but many do and it's worth trying. If your dog begins to favor their paws—picking one up from the ground because it's too cold—it's time to head inside. Keeping a dog blanket in your car can be helpful for a quick warm up when you're out with your dog as well. If you notice signs of frostbite, consult your vet for treatment. Should Your Horse Wear a Winter Blanket When Turned Out?